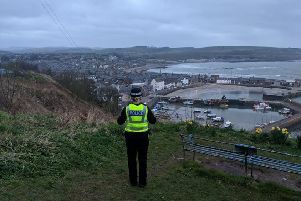 Police have released CCTV images in connection with an investigation into a serious assault on a teenager which took place at Stonehaven Railway Station last month. The incident occurred between about 2350 hours on Saturday 3 December 2016, outside the entrance of Stonehaven Railway Station, Arduthie Road, Stonehaven, where an 18 year old male was the victim of what appears to be an unprovoked serious assault. Police are keen to trace a male and female in connection with this incident. The female is described as being in her late teens to early twenties, tall, of a slim build, with long brown hair. She was wearing a beige coloured jacket and beige knee high boots. The male is described as being in his early twenties, of a medium build, with short dark hair. He was wearing a dark blue puffy jacket, blue jeans and grey and black trainers. Both are believed to be local to the Stonehaven area. The CCTV images have been released by the police.